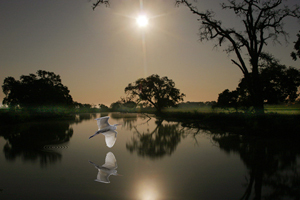 This image was photographed at the Laguna de Santa Rosa Wetlands. Although it looks like a sunrise image, the photo was actually taken at midnight on a full August moon! The exposure was 30 seconds at f6.3. 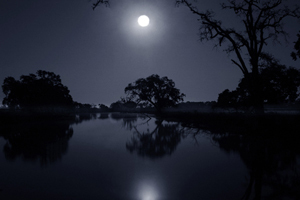 Exposing for such a long time turned a dark night into a tranquil morning at the Laguna. The “before” image shows what the scene actually looked like at midnight. The moon was incredibly bright. The fragrance of new mown hay filled the air. It was a magical evening. If I wasn’t involved so passionately with my craft, I never would have experienced standing alone in the middle of this remote area at midnight! When I got home I was too excited to sleep. I loaded the images into the computer to see what I had. The results were exceptional but not to my standard; something was missing. I decided to let it simmer overnight and tackle it again in the morning. In the Spring I had photographed a series of egrets flying to their nesting trees on West Ninth Street in Santa Rosa. I went through my files and found the perfect egret. The challenge was matching the sun illuminating the wings. They had to have a back lighted glow to look authentic. The next step was to photoshop it into the Laguna scene. It didn’t look natural without a reflection in the water. By duplicating the image and then flipping it over and putting it in the water, a lifelike reflection was created. To further add realism, a ripple was added in the water to suggest the Egret had just taken flight. See the finished poster.